If you want to start selling T-shirts with the Washington Redskins' logo without permission, you may be in luck. The U.S. Patent and Trademark Office canceled six trademarks belonging to the football team on Wednesday, saying they are offensive to Native Americans. The team, which has said it has spent millions defending trademark over the years, will appeal thedecision, a process that could take years. The Patent Office will continue to treat the trademark registrations as though they are valid during the appeals process, according to a spokesperson. In the meantime, the Redskins can continue to use the logos. If the decision is upheld, it will be hard for the team to claim ownership of its brand, a crucial step in going after the makers of unlicensed merchandise. Instead, the team will have to illustrate that it has always used the logos, rather than relying official trademark registrations. The decision came in response to a suit brought by five Native Americans. "We are extraordinarily gratified to have prevailed in this case," said Alfred W. Putnam, Jr., Chairman of Drinker Biddle & Reath LLP, which represented the five men and women, in a statement. The team has faced mounting pressure in recent years to ditch its name altogether, which is considered a slur against Native Americans. In May, 49 senators, including Majority Leader Harry Reid, signed a letter to NFL Commissioner Roger Goodell saying that the "team is on the wrong side of history," and that he should endorse a name change. A week later, a coalition of 77 tribal, civil rights and religious groups, including the National Congress of American Indians and the NAACP, signed a letter urging players to campaign to change the team's mascot. The team adopted its name and logo in 1933, when it was based in Boston. It had been known as the Braves but changed the name to honor William Henry "Lone Star" Dietz, their coach at the time, who was a Native American, according to a legal brief filed by the team in a previous matter. The trademark, which was granted in 1967, has been renewed several times, but the Patent Office previously canceled the registration in 1999. A federal judge overturned that decision in 2003, saying there was no proof that the name was disparaging at the time of registration. The team's trademark attorney Bob Raskopf said he believed this decision, like the previous one, would be overturned. "We've seen this story before," he said. "And just like last time, today's ruling will have no effect at all on the team's ownership of and right to use the Redskins name and logo." Related: NFL players warn rookies: Stop spending! The Patent Office has occasionally denied trademark registrations deemed to be disparaging in the past, and even canceled existing ones. In 2010, for instance, it denied an application to trademark Khoran as a wine, saying the name disparaged Muslims, because it be interpreted as "Koran," the Muslim holy book, which prohibits consumption of alcohol. 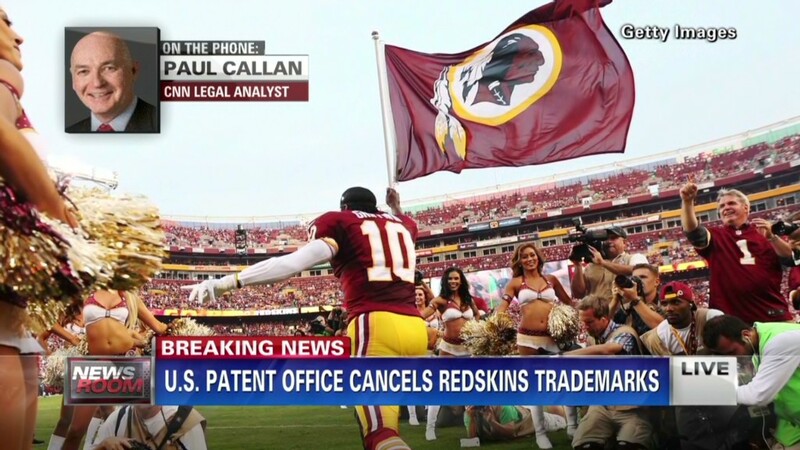 But today's ruling against the Washington, D.C. team was unique given how old and visible the Redskins brand is, according to Tim Bukher, an intellectual property lawyer at Thompson Bukher LLP in New York City. "It's a 50-year-old asset of a major NFL team," Bukher said. "I imagine it's a pretty big hit resource-wise." The structure of the NFL, which distributes profits from licensing among the teams, could help mitigate any loss to the Redskins, Bukher said. -- Lisa Desjardins, Chris Isidore, Bill Mears and Jason Durand contributed to this report.